Interpret "Andrew Staples, Pauline Cheviller, Orchestra, Chorus and Children's Chorus of the Finnish National Opera & Esa-Pekka Salonen"
sang as a chorister in St Paul’s Cathedral before winning a Choral Scholarship to King’s College Cambridge, where he gained a degree in Music. Andrew was the first recipient of the RCM Peter Pears Scholarship, sponsored by the Britten Pears Foundation, at the Royal College of Music and subsequently joined the Benjamin Britten International Opera School. He studies with Ryland Davies. His engagements include concerts with the Berlin and Vienna Philharmonic Orchestras, the Akademisten Berlin, the Bavarian Radio Symphony, and the Orchestra of the Age of Enlightenment and Sir Simon Rattle; the Swedish Radio and London Symphony Orchestra with Daniel Harding; the Swedish Chamber Orchestra and Scottish Chamber Orchestra and Andrew Manze; the Gävle Symphony and Robin Ticciati; the Rotterdam Philharmonic Orchestra and the Philadelphia Orchestra and Yannick Nézet-Séguin; and the Accademia Santa Cecilia with Semyon Bychkov. He made his Royal Opera House debut as Jacquino (Fidelio), returning for Flamand (Capriccio), Tamino (Die Zauberflöte), Artabenes (Arne’s Artaxerxes) and Narraboth (Salome), and sang Belfiore (La Finta Giardiniera) for the National Theatre, Prague (a role he repeated in the same production for La Monnaie in Brussels) and Don Ottavio for the Salzburger Festspiele. He has also sung Ferrando for Opera Holland Park and Narraboth for the Hamburgische Staatsoper. He semi-staged and sang Tamino in Die Zauberflöte for the Lucerne Festival and in Drottningholm with Daniel Harding conducting. Future opera engagements include Kudrjas and Luzio (Das Liebesverbot) for both the Royal Opera House and the Teatro Real in Madrid, Froh (Das Rheingold) for the Royal Opera House and the Deutsche Staatsoper Berlin, and Tamino in Chicago. Concert engagements included Faustzenen and Das Paradies und die Peri with both the Swedish Radio Symphony Orchestra and the Orchestre de Paris under Daniel Harding; the St John Passion with the Accademia Santa Cecilia and Antonio Pappano, the Bayerische Rundfunk Symphony Orchestra and the Oslo Philharmonic, and Dr Atomic (Robert Wilson) with the BBC Symphony Orchestra and John Adams. Recordings include Schumann's Das Paradies und die Peri with the London Symphony Orchesta/Sir Simon Rattle (LSO Live); Handel's Messiah with Le Concert d'Astrée/Emmanuelle Haim (Erato/Warner Classics) and Schumann's Szenen aus Goethes Faust with the Bayerische Rundfunk Symphony Orchestra/Daniel Harding. After a year of study at Florian Sitbon’s Studio de formation théâtrale and a second year at the Studio d'Asnières, actress Pauline Cheviller was accepted to the Conservatoire national supérieur d'art dramatique in 2010. She then spent three years under the tutelage of Jean Damien Barbin, with whom she discovered the works of Maeterlinck, Sony Labou Tansi, and Antonin Artaud. She played Caesonia in Camus' Caligula, Irina in Copi's Homosexual (directed by Philippe Calvario), and, while pursuing her theatrical training, appeared in 24 jours, the last film by Alexandre Arcady. She can also be seen in Malik Chibane's final film, Les enfants de la chance, in the lead female role. In 2014 she performed the role of Salomé in a musical comedy based on Oscar Wilde's play of the same title, and appeared in the play Humanité, inspired by the German poem of August Stramm and staged by Thomas Bouvet. She portrayed the girl in Joël Dragutin's production of Pasolini’s Affabulazione under the stage direction of Lucas Bonnifait, and was cast in the roles of “La fille aux cheveux nuit” at the Lyncéus festival in Binic, and as Calypso in an adaptation of Homer’s Odyssey, under the direction of Antonin Fadinard and Antoine Joly. She recently collaborated with François Hébert in a short film directed by Antonin Fadinard, based on Les Justes by Camus. Pauline starred in Stravinsky's Perséphone, directed by Peter Sellars at the Opéra de Lyon, and continued to work with Mr. Sellars in 2016 at the Festival of d'Aix en Provence, embodying the role of Antigone in Oedipus Rex. A lyric soprano who enjoys singing both les chansons françaises as well as songs featuring her original lyrics, Pauline Cheviller also practices dance and is an equestrian. restless innovation drives him constantly to reposition classical music in the 21st century. He is currently the Principal Conductor and Artistic Advisor for London’s Philharmonia Orchestra and the Conductor Laureate for the Los Angeles Philharmonic. He has served as Composer-in-Residence at the New York Philharmonic and Artist in Association at the Finnish National Opera and Ballet. Additionally, Salonen is Artistic Director and cofounder of the annual Baltic Sea Festival, which invites celebrated artists to promote unity and ecological awareness among the countries around the Baltic Sea. He is an advisor to the Sync Project, a global initiative to harness the power of music for human health. 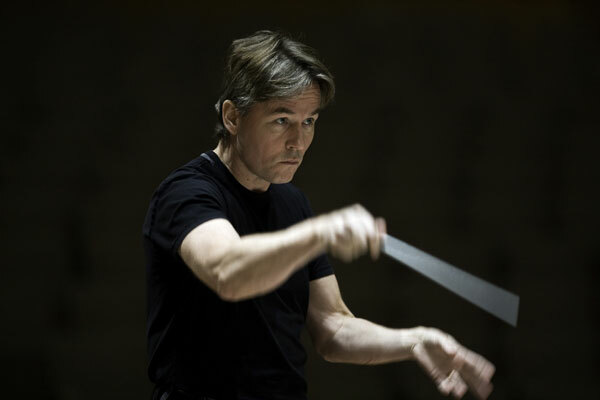 Salonen’s works move freely between contemporary idioms, combining intricacy and technical virtuosity with playful rhythmic and melodic innovations. He has written many orchestral, chamber, and choral works, in addition to concertos for cellist Yo-Yo Ma, pianist Yefim Bronfman, and violinist Leila Josefowicz. The Violin Concerto won the prestigious Grawemeyer Award and was featured in a 2014 international Apple ad campaign for iPad. Salonen was the first Creative Chair at the Tonhalle Orchestra Zürich, where he wrote Karawane for orchestra and chorus, based on a poem by Dadaist Hugo Ball, which was also featured in a sound-and-light installation in London’s Beech Street Tunnel. Salonen and the Philharmonia Orchestra have experimented in groundbreaking ways to present music, with the first major virtual-reality production from a UK symphony orchestra; the award- winning RE-RITE and Universe of Sound installations, which have allowed people all over the world to conduct, play, and step inside the orchestra through audio and video projections, and the much- hailed app for iPad, The Orchestra, which allows the user unprecedented access to the internal workings of eight symphonic works. The Chorus of the Finnish National Opera is Finland’s only full-time professional choir. It has been an organised professional choir since 1945. At the moment, the Chorus has 50 auditioned members, most of them graduates of the Sibelius Academy. The FNO also has an extra chorus, whose singers are used to augment the regular Chorus in larger works, as well as a children’s chorus with about 50 members. The chorus masters are Marge Mehilane and Marco Ozbič. The Orchestra of the Finnish National Opera is Finland’s biggest symphony orchestra. Founded in 1963 with 47 members, it grew to 101 players on moving to the new Helsinki Opera House in 1993, and the number now stands at 112. The first Chief Conductor was Jussi Jalas. He was succeeded by Ulf Söderblom (1973-1993), Miguel Gómez-Martínez (1993-1996), Okko Kamu (1996-1999), Muhai Tang (2002-2006), Mikko Franck (2006-2013, and Michael Güttler (2013-2016). Since the autumn of 2016 Esa-Pekka Salonen has been Artist in Association, and since the Autumn of 2017, Patrick Fournillier has been the Principal Guest Conductor. In addition to playing for operas and ballets the orchestra regularly gives both symphony concerts and chamber recitals of its own. An orchestral concert has usually also been given in conjunction with FNO foreign tours. The Orchestra of the Finnish National Opera has recorded most of the Finnish operas. Among the most recent recordings have been Tuomas Kantelinen’s ballet suite Snow Queen, Erich Korngold’s opera Die tote Stadt and Igor Stravinsky’s melodrama Perséphone.